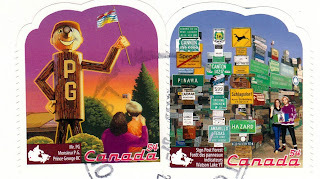 A Canadian postcrosser named Carole sent these great stamps, the best I've seen in ages from her country. They seem to celebrate offbeat tourist attractions around Canada. Don't you want to go? Carole's got a heartfelt blog: www.carolemsblog.blogspot.com. Please take a look! 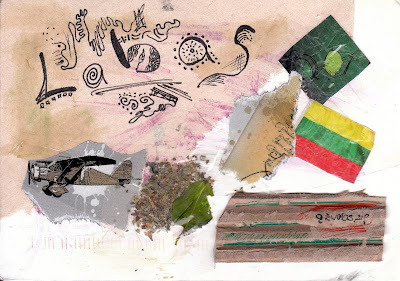 A Lithuanian postcrosser made this cool collage tribute to her wonderful country. She even included some basil from her kitchen garden! 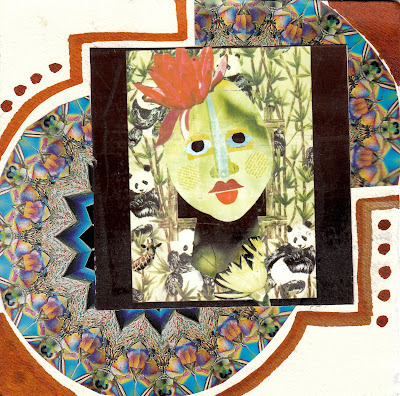 Sandy Sapienza used a photo of one of her collages to make this card. You never know what you'll find in a bamboo grove. 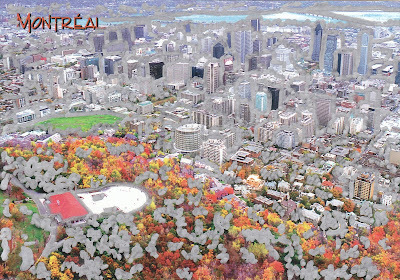 A Canadian postcrosser, and aspiring novelist, sent this 'silvered' view of one of her favorite cities. 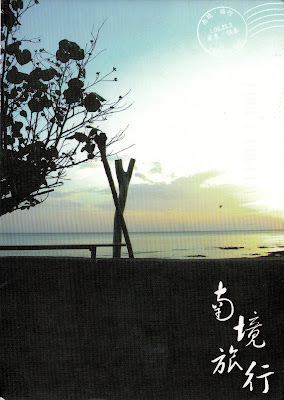 A Taiwanese postcrosser made this pretty postcard from some travel material. It's Christmas in July at the ballpark tomorrow. 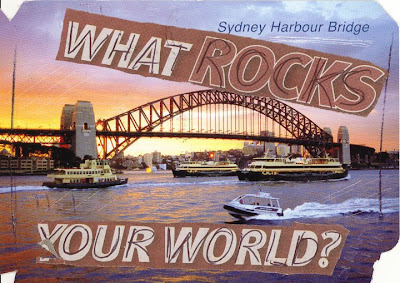 That spurred me to use the cover from a booklet of outsized postcards to make this card for a friend. The white space here is actually a hole. 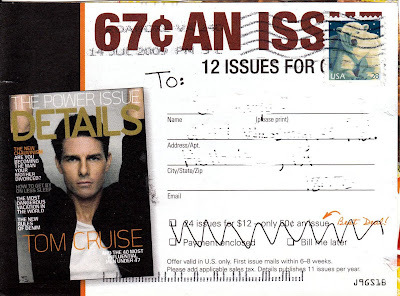 I wonder if the card will make it through the mail intact. 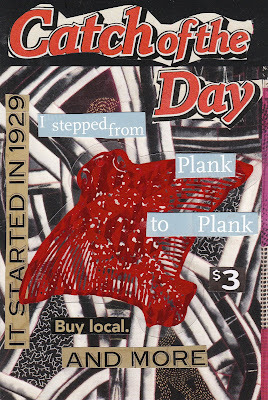 Making altered cards is keeping me from going off the plank (a heartfelt nod to Emily Dickinson) during a pressurized period. Just a little bit of visual fun on a day when Mark Buerhle pitched a perfect game against the Tampa Bay Rays, formerly the Devil Rays. The local Morning Call reported the other day that owing to a decline in postal volumes the once-familiar blue mailbox is fast disappearing here in the Lehigh Valley. Since 2004 the number of mailboxes in Allentown declined from 300 to 63; in Bethlehem, the number went from 150 to 83. 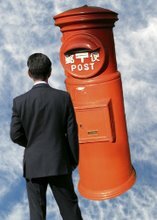 Living in the country, I don't much use mailboxes except at the post office. But I always look for them wherever I go, here or abroad. Are they really going the way of the pay phone? 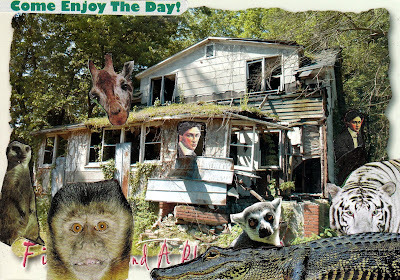 I altered an ad card to make this postcard for 94-year-old 'Mrs. October', who is locked in a battle with Comcast. After moving into a retirement home this May, she discovered that she could no longer watch her Phillies on TV. The Phillies are carried by Comcast; the home is wired for DirectTV. Radio broadcasts aren't much of an option as Mrs. O has trouble hearing. Carla (see the paper plane below) sent a correction. I'm glad she did. The address is www.365lettersblog.blogspot.com. 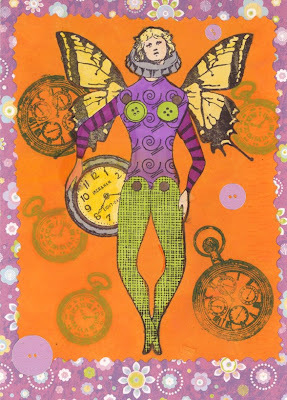 She started the blog on January 1 with the goal of writing a letter a day. It's interesting stuff. Click on the link for a look. 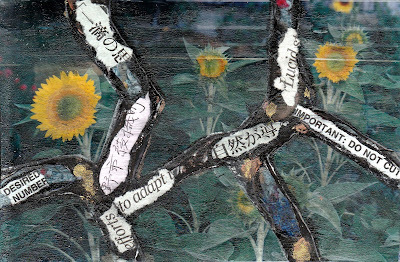 I altered another unused postcard using torn photographs, text, textile paint, and ink. I love using random old photographs like this. 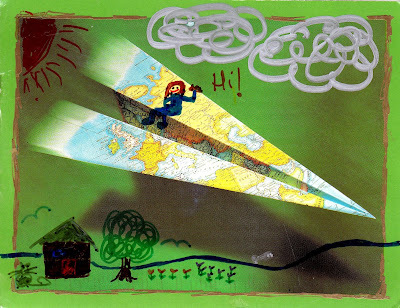 Someone named Carla who lives in Texas used this paper plane postcard as a canvas. Charming! I tried to access the blog (www.365letters.blogspot.com) she mentioned but it was a no-go. Luckily, she sent her snail mail address. I'll try a reply there. 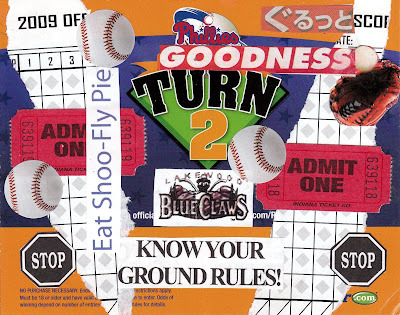 This hilarious altered card came from friend Sandy at the tail (oops) end of her trip to the Poconos. 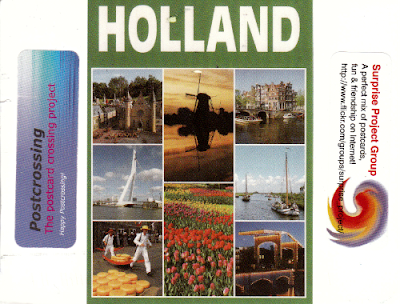 A Dutch postcrosser altered this multiview card with two postcard stickers, one for Postcrossing, the other for another online site. 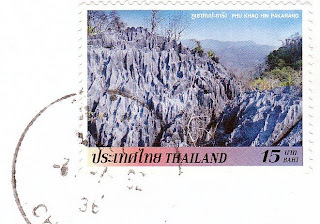 I didn't know Postcrossing had a sticker. I like, I like. 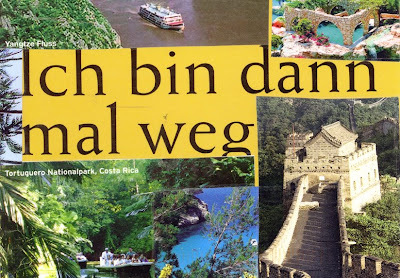 Here's a card from Germany that was collaged from travel brochures. The words mean "I will leave now" in German. Yes, a vacation right now would be wonderful! 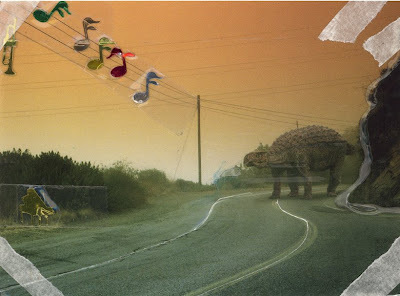 This postcrosser from the Netherlands created a story using an Ankylosaurus postcard. She cut a path for the beast and added stickers and tapes on the ends. 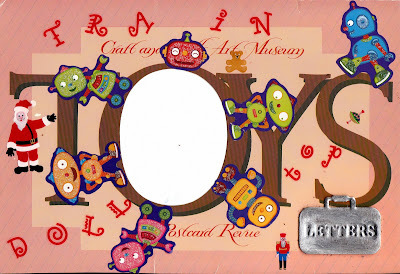 And here is part 1 of 2 cards sent by Patty Davidson for the altered postcard project. Thanks for sending a card each to Jacqueline and me. 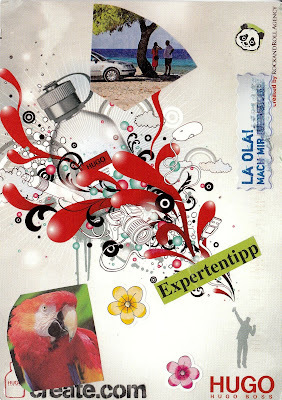 We've added your blog link http://justletterrip.blogspot.com/ to our links. 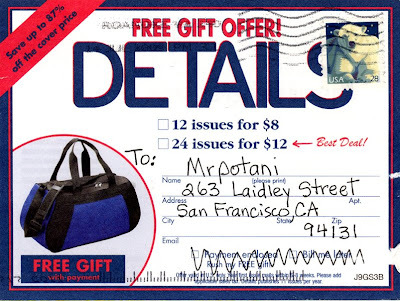 What a good way to recycle subscription fall-outs! I also loved the technique you describe in your blog for reusing window envelopes. Thanks, Patty! Old friend Inga called yesterday from her home near Vancouver. She's recently back from a family trip to Germany, which she bracketed with a cruise that took her to Tallinn, Copenhagen, Stockholm, Helsinki, and St. Petersburg and a spur-of-the-moment trip to Turkey. Next week she's off to Ottawa for a weeklong haiku conference. Shortly after that she's planning 10 days in Japan. 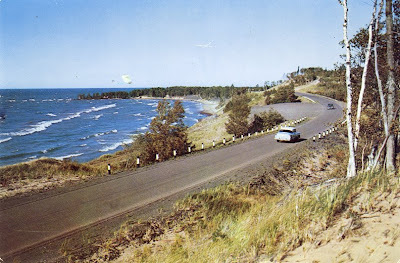 All that, and not a single postcard coming my way. When I asked, Inga just laughed. Wish I were there! Patty Davidson of www.justletterrip.blogspot.com used one of those annoying subscription forms which are always falling out of magazines to make an altered card. She affixed the form to recycled cardboard, which she used for the message side. 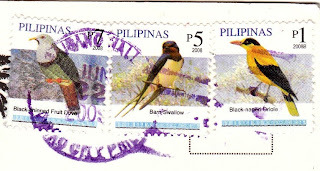 Patty's blog is filled with ideas about recycling envelopes and such for use in snail mail. Check it out! 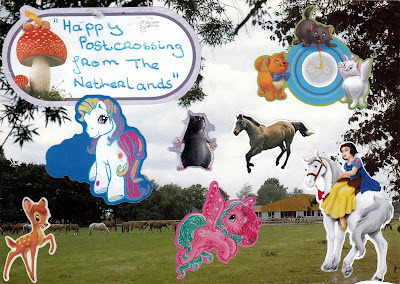 A Dutch postcrosser named Jackelien (gotta dig the name) from Zuidlaren sent this clever altered card. 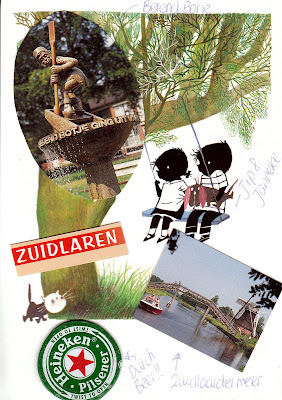 She used a postcard showing Jip and Janneke, the duo from the well-known children's book series, and added a view of Zuidlaren and another of Berend Botje (worth a Google search). 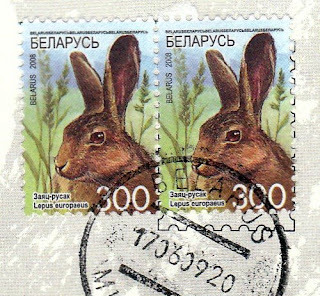 On the back she wrote a Dutch nursery rhyme about old Berend, who sailed away never to be seen again. The Heineken? She was drinking it as she wrote the card. Cheers! 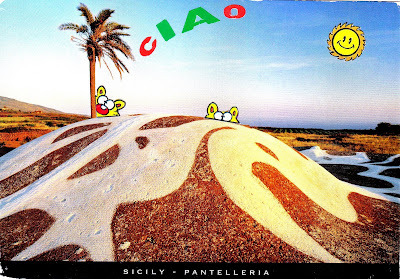 This cheerfully goofy card comes from a Sicilian postcrosser, who used a vista on the beautiful island of Pantelleria. She wrote that it was her first altered card. Good job! 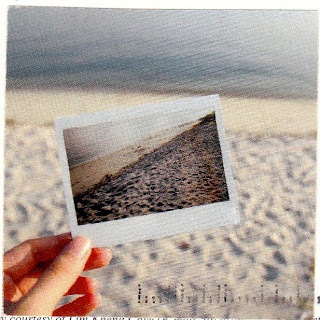 A Singapore postcrosser 'altered' her card by adding this photo she had taken to the message. 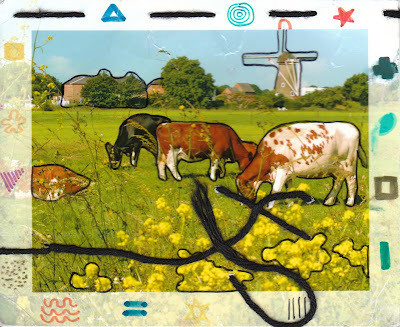 A jazz-singing postcrosser from the Netherlands, who has a cat named Salsa, sent this cool altered card. The string on it had snapped but the card still made it. 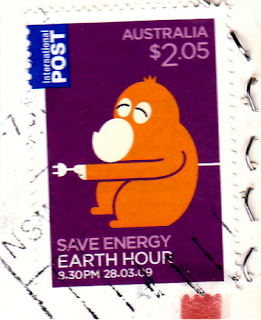 Double red letter day: It arrived with the one below from Sydney. 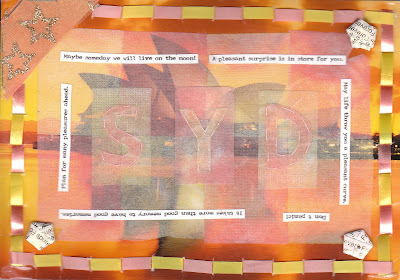 My request on postcrossing for altered cards got an Australian sender to break out her craft supplies and alter a sunset view of the Sydney Opera House. Good stuff! Amazingly, it arrived pretty much intact. 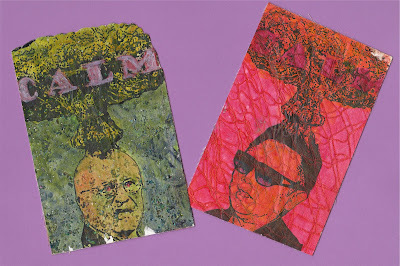 These two cards are for the Zero Nuclear Weapons, Zero Weapons of Mass Destruction mail art show that Mrpotani is organizing. For details about the show, see the post for May 24. 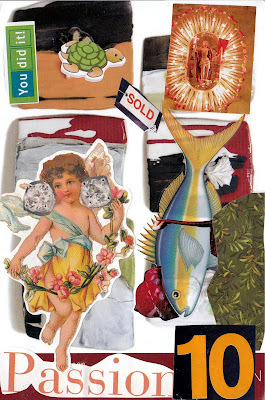 Fellow mail-artist Sharon Zimmer is hosting a mail art call. Let's send her some mail! NEW MAIL ART CALL: FOUND TEXTAny size, any technique, free, no returns. Documentation will be online at www.sharonzimmer.com and deadline is October 1, 2009. Please do not send email entries. 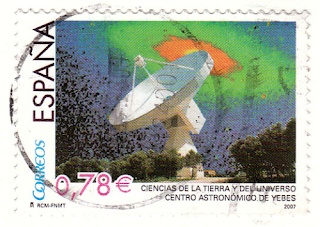 Postal mail only! Thanks, in FLUX we TRUST...pass this call on to your friends who FLUX their muscles. Stickers, stickers, stickers. Why are they so popular? These two 'stickered' cards are from postcrossers. 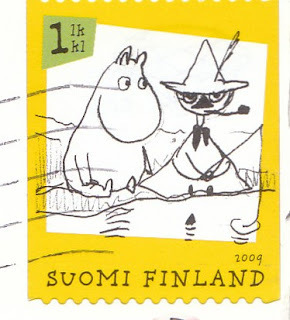 The top one is from Finland and the bottom from the Netherlands. Fun, fun, fun. 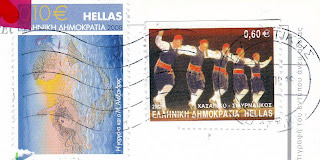 Recent stamps of note from around the world, including a couple of repeats. What can I say? I like them. 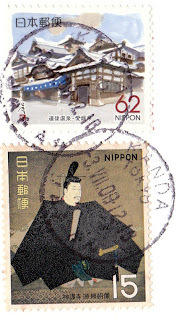 My pal Uchida K. in the Ayaori Post Office, my old neighborhood p.o. 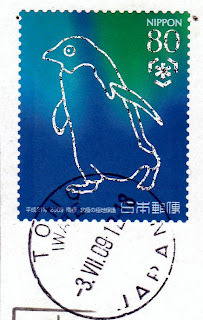 in Tono, Japan, sent this ultra-cool postcard. It's in the shape of an old-fashioned post box, the kind that was phased out years ago because drunks and other fools would do things like pee into them. 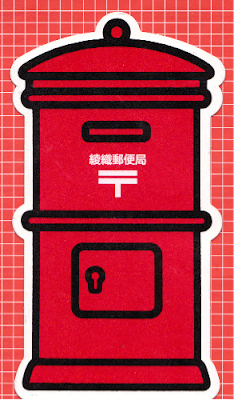 This one reads Ayaori yubinkyoku just above the symbol for post. How cool is that! Kathy Connor sent this cool card, a round robin creation from the little altered card workshop I co-led at Sewing by the Sea this March. Thanks for sending it along! 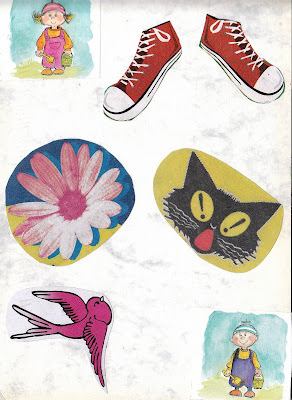 This altered ad card, too, may be a family effort. 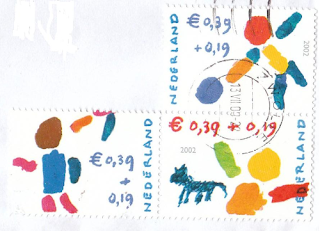 It's from a German postcrosser who wrote that she does lots of things with her five-year-old son. Altered cards: a family kind of thing. 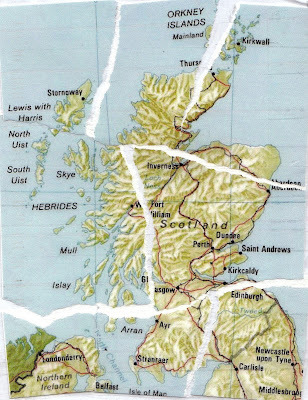 A postcrosser from Scotland had his wife make this altered card, which she did by cleverly taping pieces of a fractured map of Scotland to an envelope. Now it's time for him to step up. 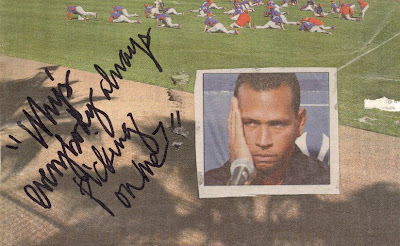 A very cool altered baseball card from Jacqueline. Poor A-Rod. 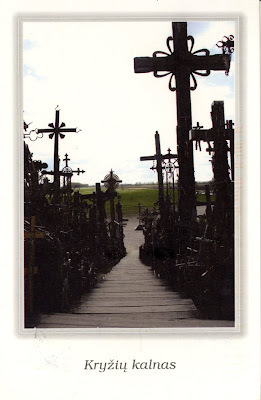 A wonderful creepy card with the title, "The hill of crosses" from a 13-year Lithuanian postcrosser. 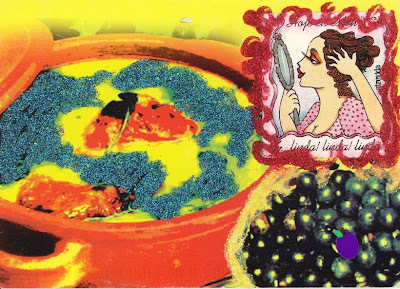 From a Brazilian postcrosser, this originally was a duck soup card, which she altered by using stickers and lots of glitter. 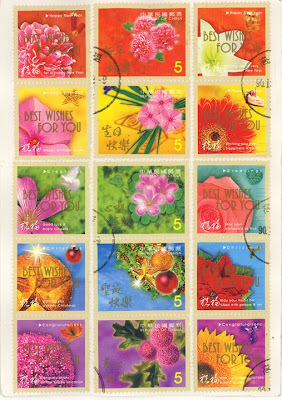 A colorful card from a Taiwanese postcrosser. 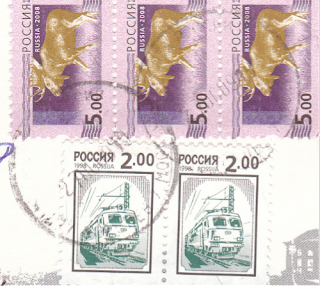 She adhered floral greeting stamps on the front.